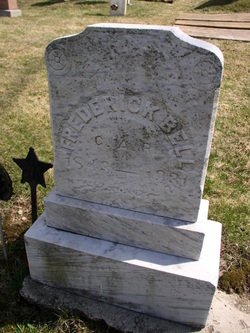 The death of Frederick Bell, a well known resident of New Castle, occurred Monday evening [at the Mark Wentworth home in Portsmouth]. He was a native of New Castle, the son of Frederick and Hannah (Leach) Bell, and was in his 86th year [an 1843 birth date on grave would indicate he was in his 88th year]. Mr Bell was the last surviving veteran of the Civil War residing in New Castle and was a member of St John's Lodge, No 1, A. F. & A M, of this city. He is survived by three nieces and one nephew.